If you’re a reasonably serious golfer, you definitely should review the following list. Over the years I’ve added ten items to my golf bag that every golfer should consider carrying. All of these items are readily available, so adding them to your bag should be really easy. First, a word or two about what I won’t be talking about: the really obvious stuff – balls, tees, ball markers, a Sharpie, divot repair tool, and the like – I assume you have the basics in your bag. That said, on to the list, which contains at least one item I will wager 99% of you DON’T carry and which should absolutely be in your bag – in fact, the better a golfer you are , – the more important this item is. 1. Medical kit. This needn’t be elaborate, but you should take a ziploc bag and at a minimum put the following into it: bandaids (the flexible fabric type, not plastic; they work MUCH better) ibuprofen, chapstick, white adhesive tape, and sunblock. 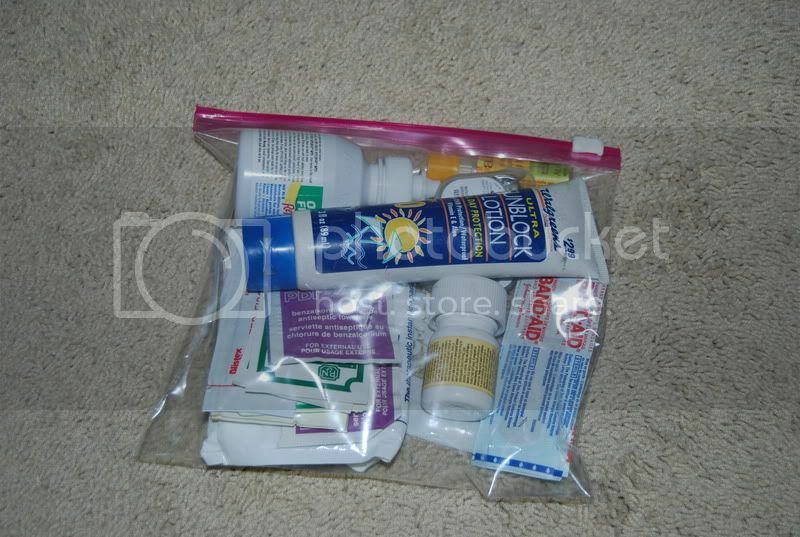 This is my med kit below – it contains the items listed above (except the adhesive tape – I’m out of it at the moment) plus some antiseptic wipes, “sting relief” pads, and another item I’ll mention later as it’s significant enough to be mentioned on its own. 2. Cell phone. Let me say right away that it drives me a little nuts to hear someone’s cell phone ring while we’re playing. I am NOT suggesting you leave an audible ringer on when your cell phone is with you on the course; put it on vibrate. a) A medical emergency. If someone in your group has a heart attack or is otherwise incapacitated and needs help quickly, you can call 911 without hesitation. Being able to call for help right away could literally save someone’s life. b) On a less serious note, if you’re playing in a tournament and have a rules dispute or question, call the pro shop and speak with the head pro. I DO carry the USGA rules book with me. But under tournament pressure, finding the right rule and interpreting it can sometimes be difficult – and time consuming. I suggest you call the PGA pro and if he / she can’t clarify the rule over the phone, he or she will come out and rule on the spot. Most professionals have heard the questions specific to his/her course many times and can give you a ruling in a matter of moments over the phone. 3. Snacks. If you start bonking or simply feel your concentration is flagging during a round, it’s very handy to have some healthy snacks with you. Bring along Clif bars, granola bars, those little raisin boxes, or perhaps some jerky. You want to get some carbohydrate in you as soon as you can. Avoid super sugary snacks like candy bars – you’ll just crash later on. And bring water with you – obviously, you always want to stay hydrated. 4. Extra gloves. 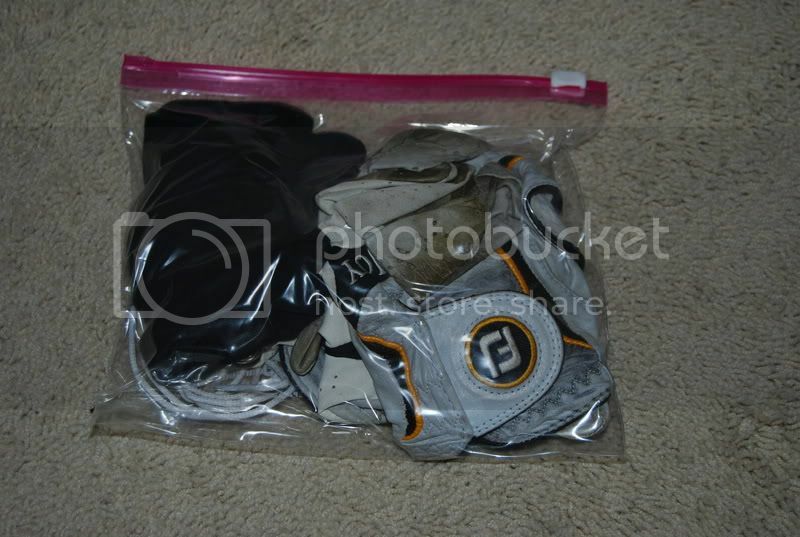 Instead of wearing your golf gloves to the point where they have holes in them, buy a replacement and put the used glove in a ziploc bag while it still has a little life left in it. I always have at least 4-5 extra gloves in a bag, should it start drizzling or raining lightly when we’re playing. A soggy glove gets old fast, and prevents you from properly gripping the club. The black object on the left hand side of the photo is a pair of rain gloves, by the way. They’re made of the same type of material as used for wet suits, and it seems the wetter they get, the better they grip. 6. Extra socks: Throw an extra pair of socks in your bag. If your feet are perspiring or your Dry Joys aren’t living up to their name, a fresh pair of socks at the turn will make you feel much better! They weigh practically nothing, and you’ll really appreciate them when you use them. 7. Toilet paper: OK, I know this sounds a little weird, but here’s the explanation: if you have an allergic attack, your nose starts running due to cold temps or you actually have a head cold, or you need some tissues for some other reason, having a quarter or 1/3 roll of TP in your bag is REALLY handy. Next time you see a roll of TP in the house that’s down to about 25-33%, replace it and throw the (now small) roll in a Ziploc bag (no, I don’t own stock in the company) and put it in your bag. Next time you’re on the course and get into a sneezing fit or have a runny nose, you’ll thank me. I mentioned this item to my wife (a golfer) and she screwed up her face and said: “…uh, tissues, maybe.” Whichever you prefer. 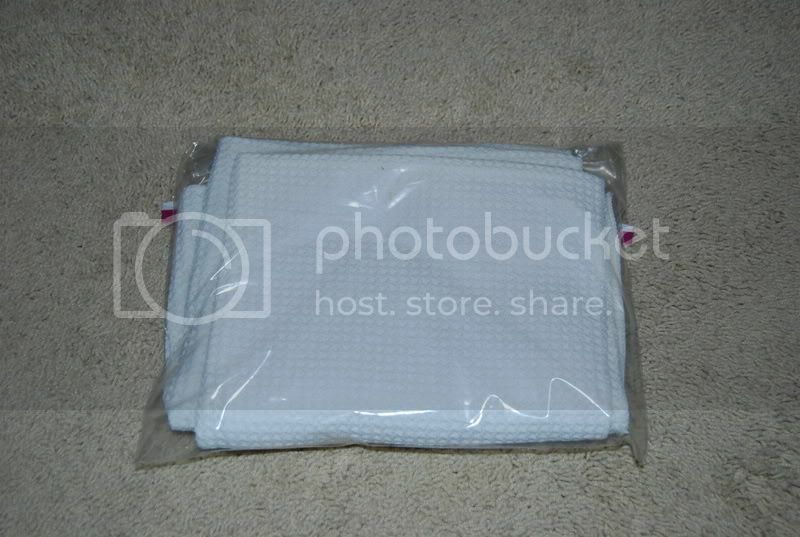 8. Business Cards: throw a few in one of those small uh, er, zippable bags. You never know who you’ll meet on a golf course, and networking is a good thing. 9. This one is a bit specific, but if it applies to you, please take heed: Extra contact lenses. If you are a lens wearer, put an extra pair and a small bottle of solution in your med kit. Should you lose a lens during a tournament, trying to play one-eyed will surely ruin your day. d) Put them in your bag. If ever, mid round, you decide to re-tighten your shoe laces and one of them breaks, you are screwed. If you’re playing in a tournament, doubly so. Break a lace and the best you can do is try to cobble something together with the remnants. Your shoe won’t feel right, and it’ll mess with your mind. Kiss your round goodbye. Buy an appropriate pair that will work in your shoes, and put them in your bag. It’s tremendous insurance, cheap, and weighs nothing. I haven’t mentioned pen knifes, multi-tools, and the like. If you need a knife on the golf course, you might want to take a hard look at your playing partners. :-) In the last 10 years I’ve never needed a knife or screwdriver, etc. on the course. I wouldn’t bother. One thing I wholeheartedly recommend for any good golfer is a rangefinder. the Bushnell Medalist is a great unit – it uses the “pinseeker” technology used in the Yardage Pro 1500 model, is good out to 1,000 yards (exactly how far do you hit the ball, anyway?? – who needs a unit that works to 1500 yards?) and can be picked up on eBay for fairly reasonable prices. And they’re tournament legal – check with the Pro before using, however; local rules may prohibit them. If you’re a walker, throw a couple of extra scorecards from your home course in your bag. That way if you forget to get one from the pro shop or starter, you’ll have one on hand. That’s it. Please share your ideas by commenting. If you like what you see here, please subscribe to Practical Hacks by clicking on the orange RSS button at the top of the right hand column, or subscribe by email with the link below the RSS button. And if you like this post, please share it! Thanks!! I like your list. I also carry a small bottle of aloe vera that is good for sunburns and insect bites. Thanks for your comment – although I didn’t bother mentioning it in the post, I also have a few packets of insect bite cream in my kit – you can actually see them beneath (LH side) the tube of sunscreen in the photo above. I take it you use a buggy Kevin :-) Or a caddy? Like the spare shoe lace tip though, I’m onto that. Love the list man I have been stung on the course countless times so the bite relief and repellent r tops on my list! Thanks a million. I have been looking for a good list for ages. just a question though is there anything else you should have in the bag. Your wallet with cash for the beer. They do not accept credit cards on the course. You forgot the beer. I always add 2/3 emergency beers for the golf bag JUST IN CASE! King Cobra is usually a good choice. Good lord. Boy Scouts. Try carrying a few golf balls, tees, athletic tape and glue for fingers (gorilla glue is the best for cuts and knicks), a ball marker (not 15 ball markers – a ball marker), a pitch repair tool, a hat and bottle of water. Leave all the other crap behind. The car is parked less that 2,000 yards away most likely if you have to call it a day… Travel light, play swiftly, and shoot low. Lets move it out there people. This isn’t pack packing! In the same light as the small first aid kit and possibility for heart attackers (older and younger players alike, your group or even someone nearby) be sure to include some form of Aspirin like Bayer…it can mean the difference between someone making it through a heart attack or not.